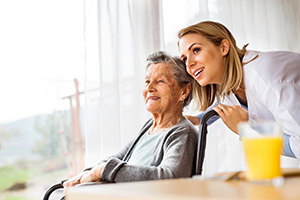 At Serenity Home Care, we’re committed to delivering specialized care that prioritizes your unique needs, and we’re fully staffed with a caring team of trained, certified in-home care professionals in order to get the job done. On top of the extensive selection of housekeeping, companionship and personal care services our team delivers, we’re pleased to provide a comprehensive range of nursing services for your convenience. Conducting assessments and evaluations of client health status. Client needs routinely change over time, and we keep a close eye on your health to ensure that we’re customizing our care plan as necessary. Medication management and oversight. Taking the appropriate medication at the right time is vital for both your safety and the effectiveness of the medication itself. Our caregivers are meticulously trained by our RN to ensure your medication is administered correctly. Reassessing nursing and medication needs. While you may rely on certain medications and nursing services now, evolving factors may demand a change in approach – which we can accommodate. Coordinating client care with other healthcare professionals. Whether your typical care routine involves physical therapy or a visit to the nutritionist, we’ll make certain the necessities are covered in your care plan. Why Choose Our Home Nursing Services? The Serenity Home Care team helps clients throughout the Greater Portland-Beaverton area remain independent, safe and comfortable in their own homes. We start your care with an in-home assessment, which allows us to get to know you and your family. Once we’re familiar with your situation, we’ll provide a custom care plan that meets your every need without compromising your lifestyle. Aside from our nursing services, we offer meal preparation, personal hygiene assistance, shopping services and much more. Seeking in-home care from a team of compassionate professionals? Turn to the experts at Serenity Home Care. Contact us online or call us at 503-520-9400 for more information.